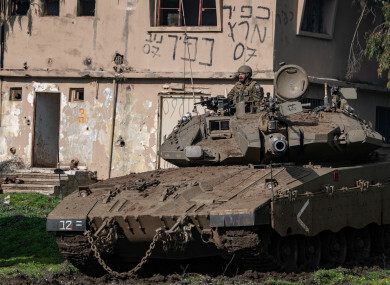 An Israeli tank in the Israeli-occupied Golan Heights. US PRESIDENT DONALD Trump announced today that the United States should acknowledge Israeli sovereignty over the hotly contested Golan Heights territory. Trump’s abruptly announced decision was immediately cheered by Netanyahu, who faces a tough reelection battle and visits Washington next week. “President Trump’s decision to recognise the Golan as part of Israel is strategically wise and overall awesome. Well done, Mr. President!” Graham tweeted. Trump’s announcement came as Secretary of State Mike Pompeo is in Jerusalem, lauding warm ties with Israel and promising to step up pressure on Iran. This is the second diplomatic bombshell dropped by Washington, which is Israel’s main backer, in seeking to redraw the fraught Middle East map. In 2017, Trump went against decades of practice by recognising the disputed city of Jerusalem as Israel’s capital, rather than the previously accepted Tel Aviv. The Trump State Department has also dropped previous definitions of the Palestinian territories of the West Bank and Gaza Strip as being “occupied” by the Jewish state. Email “Trump says the US will recognise Golan Heights as Israeli territory”. Feedback on “Trump says the US will recognise Golan Heights as Israeli territory”.